Geographic isolation is a term that refers to a population of animals, plants, or other organisms that are separated from exchanging genetic material with other organisms of the same species. Typically geographic isolation is the result of an accident or coincidence. The people of Finland, who are secluded to some degree from the rest of the world by water, develop certain diseases due to the lack of genetic material from other ethnicities and races. Physical barriers prevent fish from one stream from mating with fish from another stream, leading to a less varied gene pool among those fish. As time passes, the fish become unable to successfully mate with other groups. A mountain range prevents two types of goat from mating, causing the gene pool to become less varied. 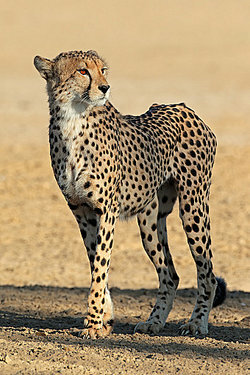 Cheetahs separated from a larger group mate with each other, resulting in a less varied gene pool. Genetic interchange between finches is prevented when a flock becomes isolated from the rest on an island. Eventually, the isolated group emerges as a completely separate species. A group of genetically differentiated chimpanzees is unable to mate with any other chimpanzees outside of their group due to physical isolation, leading to the development of certain diseases that genetic material from the other chimpanzees would have prevented. A group of genetically differentiated bottlenose dolphins is separated from other members of its species and eventually goes extinct. An earthquake causes two populations to become separate from each other. Over time, each species experiences genetic makeup specific only to their own smaller, less diverse populations. When a piece of land breaks off from a continent, the animals on the piece of land are only able to reproduce with their own populations. This results in the animals becoming entirely separate species over time. Temporary isolation from a larger population of flies results in species behavior that causes a subgroup of flies not to mate with one another. When the subgroup joins the larger group, the two are now unable to produce fertile offspring. A forest fire causes the permanent separation of a group of deer from their native population, causing the small group to interbreed only with one another. Over time, the group becomes an entirely different species. An isolated group of beetles on a hill only work, eat and mate with one another. As a result, only genetic material within that small group is exchanged, leading to a less varied beetle population than others that mate with different subgroups. A population of brown-haired people is separated from those with other hair colors and, as such, does not mix genetically with populations of any other hair color, leading to a population that is of homogenous brown hair color. A small and isolated town contains individuals who do not marry anyone who was not raised in the town, resulting in a less diverse gene pool than a less homogenous population. Now you have some examples of geographic isolation and can better understand what this concept means and how it exists in the real world. "Examples of Geographic Isolation." YourDictionary, n.d. Web. 23 April 2019. <https://examples.yourdictionary.com/examples-of-geographic-isolation.html>.